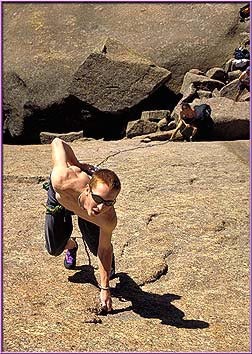 Perhaps Fall Wall is the most popular crag/area at Vedauwoo – everyone just seems magnetically attracted to the place. Fall Wall is the rightmost (eastmost) component of the South Face of the Central Massif (CM in the above topo), the others being the Coke Bottle and the Walt’s Wall Area. It certainly has a long history of old, bold leads resulting in spellbinding tales (see examples). 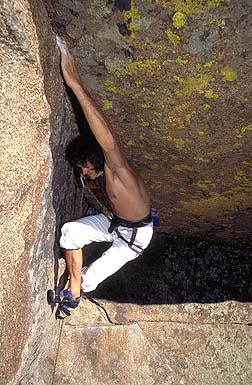 It has a wide range of climbing grades (from light to difficult) and climbing styles (from trad to sport). Fall Wall gets sun most of the day, is usually protected from the ever present wind and parking is convenient. It is also the wall most tourists see, so even if you’re on a 5.5, you can show off and they will think you are a hardperson. The LOWER TIER is somewhat low angle in places and steeper in others. 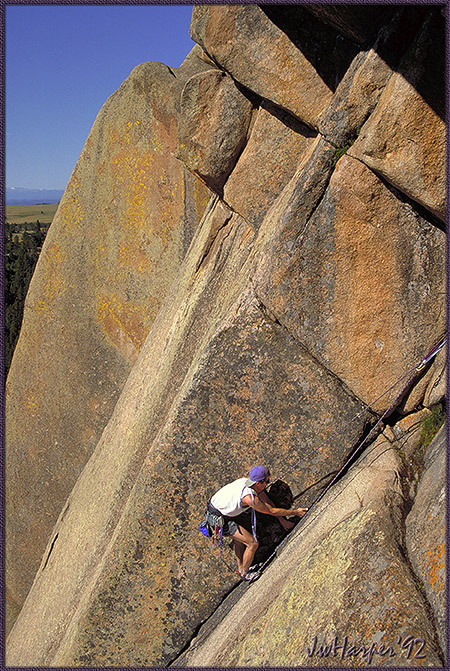 It offers mostly slab climbing with features like shallow scoops, dishes and edges, yet its penetrated by a smattering of cracks. 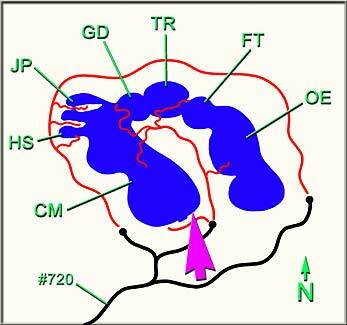 There are solid anchors at convenient locations, so routes can be toproped. 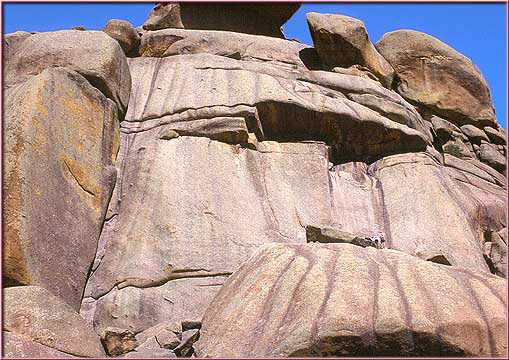 The UPPER TIER is mostly wide, water-carved troughs featuring thin exfoliation edges, protruding crystals and inclusions of many sizes. Accordingly, most routes located here are stiffer in rating. Try Fall Wall during the week because a ‘take-a-number’ machine has recently been installed for weekend use (not really, but it seems to get that crowded sometimes). 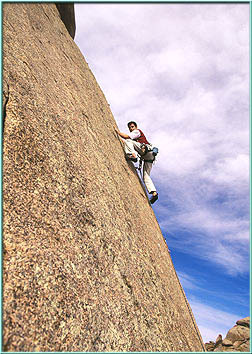 Nonetheless, its a great place to gather, enjoy the expansive 180 degree panorama, and jump on some excellent climbing. The SPIDER GOD ALCOVE (topo to the right). The Weber Brothers are climbing FALLOUT and the leader (red arrow) has just passed the only bolt on the line. 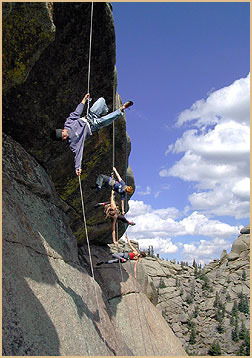 The top anchors are about 15 feet above the leader. 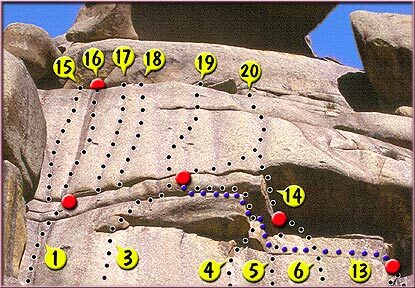 Also shown are other climbs that are found here. Unfortunately, the numbers on this shot do not correspond to those in the descriptions….. sorry about that. 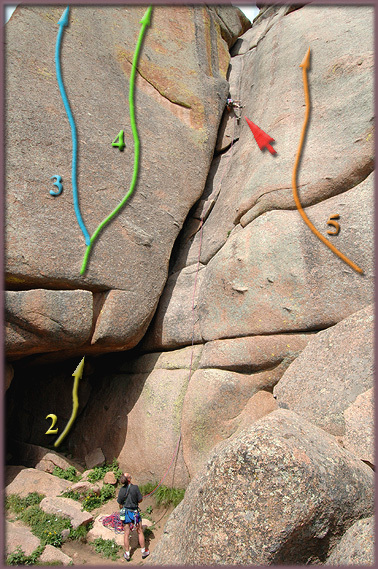 These routes are (2) TM Chimney, (3) Space Oddity, 4 (Young Guns) and (5) Spider God…. 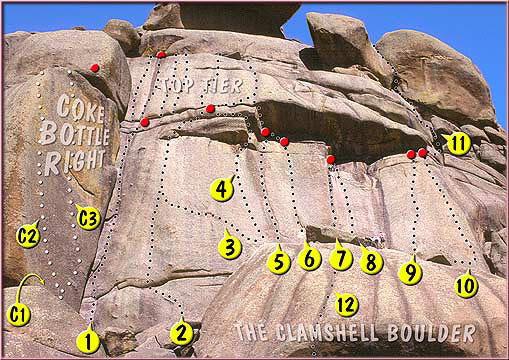 The Spider God Alcove, home of 5 very unique climbs. 12.) Clamshell (5.5) Jump on the sparsely protected vertical lip of the giant Clamshell Boulder that underlies most of Fall Wall. Can be done as a top rope problem. 17.) Krypton Sociopath (11a R) Similar to #15 but thinner and run out. (Harper and Kelman, ’92). Careful: Usually done as a top rope problem. 18.) Argon Depressive (11a) Similar to #16 but thinner yet. Top rope this one if you want to live!! 19.) Upper Fall Wall (5.8) This route is courtesy of the painful, pioneering efforts of Rex Hoff who fell backwards and broke both ankles while attempting the first ascent with no bolts. This area was known early on as the ‘Falling Hoff Slab’. (NOTE: FA, 12/2/65, J Mathiesen and J. Halfpenny) Wander up the face above and right of the Fall Wall Anchors using lots of friction and small edges past 2 bolts.